A further step along the path to enlightenment is the study of Zen, which Kendo pursued in both the past lives he has described to us, in Kamakura and in Kyoto. Zazen (seated meditation) of course forms a fundamental part of studying Zen, but the fundamental metamorphosis of consciousness which is sought in Zen is also facilitated by immersion in both intellectual and intuitive challenges. Zen has traditionally been imparted to stuents via contact with a master, whose actions and statements need to be interpreted with far more than mere intellect. The master presents the student with conundrums known as Koans, which defy logic, confound reason, and deeply confuse the mind; further to the intuitive empowerment which arises from Zazen meditation, when the conscious self is active and invoked (which, of necessity, occurs when we are required to interact with the outside world), the way it mediates reality is thus deeply challenged and forced to evolve into a mechanism of much greater ability and refinement, and this brings benefits which go far beyond what might ever be hoped for from ordinary consciousness. In his commentary on consciousness, Kendo describes how consciousness is able to completely deceive us; when contemplated, consciousness can be viewed as the process by which the world is interpreted and presented to our inner selves in an understandable form, but, unlike the world it assesses, it is normally never directed towards self-analysis, and making sense of the outside world is pretty much a full-time job anyway. Above and beyond the "hard-wiring" of species-based behaviours, pattern-recognition circuits, and genetic and hormonal imperatives, as it develops, the mind learns to make rationalising decisions about what things are or are not, what matters or does not, and even what we are or are not: left to its own devices, consciousness elects itself as the measure of all things, and the spokesperson for the self. Viewed objectively, ultimately, this self-importance amounts to nothing less than blind ego-mania. As Kendo has pointed out, one cannot remain in meditation at all times, and for most of us, there is a demanding outside world to deal with - rightly so, because this is destiny at work, challenging us to become enlightened despite a bewildering range of other commitments. But enlightenment is possible, if sought using the efficient systems which Kendo has developed. The Zen which Kendo offers us is in accord with all his teachings - aimed at the West, it is the fusion of Eastern and Western wisdom, it is practical and useable, and it's efficient and effective - in fact, with its emphasis away from focus upon doctrine, Zen epitomises Kendo's approach to enlightenment in its simplicity, efficacy, but also in the depth of the challenge it presents. 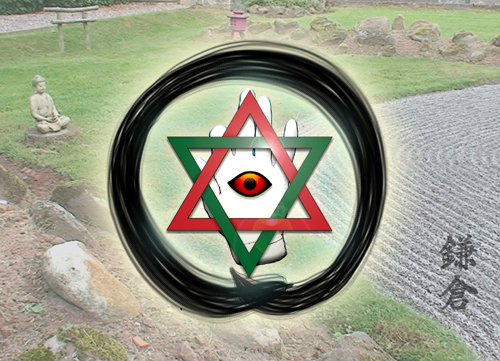 If you have absorbed and begun to live by the wisdom which Kendo has expressed previously, then you have already been highly selective and discriminating about what is in your mind, and his Affirmations will already have begun to help you take charge of the direction in which you're heading... In combination with Zazen, this is a great beginning to finding true enlightened empowerment, and Kendo's Zen is a next step which awaits you, at The Retreat and in meditation. When you think about it, Kendo himself is Zen - he exists here only as he projects himself through Yogensha, and yet, without ever speaking, he has healed, motivated, and inspired many thousands of people. As his empowering revelations continue to unfold, the glorious journey of this Zen samurai continues, and every day, newcomers to his unique, profound, and challenging wisdom take their own first steps on the pathway to enlightened empowerment. Kendo is always working on new ways of bringing empowerment to humanity, and as his body of work grows, it remains an enduring source of enlightenment and wisdom. Readers are advised to re-read the Mysticism and Empowerment pages - their information and concepts will continually provide new food for thought and guide you towards enlightenment and empowerment, inspiration and success, and, of course, do keep watching the Blog for announcements on all things Kendo!